These words may have escaped my lips this morning. 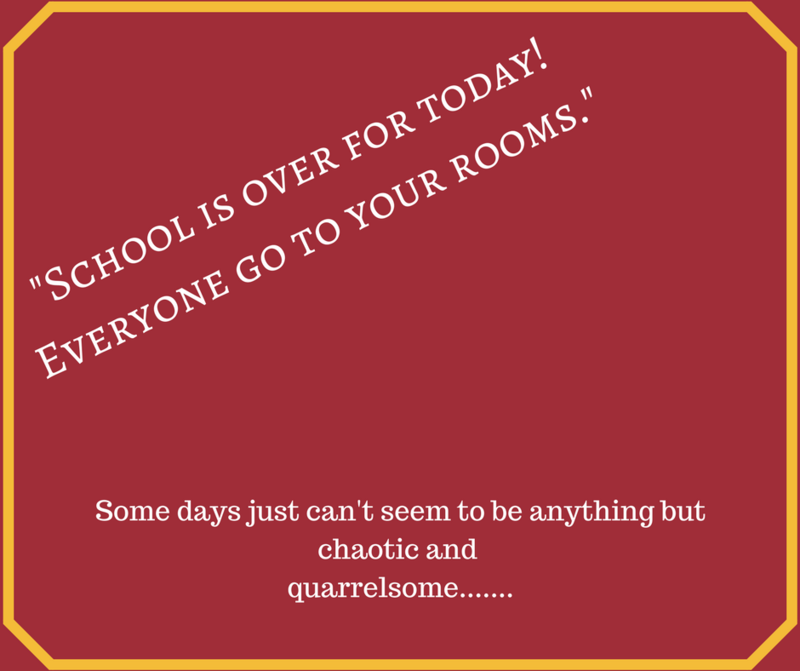 Actually one child was already in his room for the third time- banished for an excessive lack of courtesy towards the other students who didn’t really appreciate him waving his hands in their faces and singing loud nonsense songs as he reached for a sharper pencil. With five children ages 10-2 I expect a certain amount of noise and confusion. New things, changes in routine, or new topics of interest do (and to some extent should) elicit lots of questions, requests for clarification and so on. But today was a typical day. No deviations from the established routine, and yet every (it seemed) interaction between the children either started or ended with bickering or someone minding someone else’s business! The final huffy exchange between the biggest kids over whether one of them had touched the other one’s work was the last straw! It was either send everyone to solitary confinement or really lose my cool (which had been slipping all morning). OK. Everyone gets some cool down time. I comfort (but do not nurse ) the toddler. Call the big three down one at a time for a discussion of how each individually is contributing to the chaos and strife today and what they each need to change. Lunch with a strict injunction against speaking during lunch since children who quarrel with each other about everything need to learn to ignore or accept their siblings table manners without yelling at them or correcting them- this is what we call a “Trappist Monk Lunch”. Put the toddler to bed, lie down for twenty minutes myself after I eat my own lunch and catch up on Instagram. In a few minutes we’ll get up from naps and see if everyone is ready to work together to get us out the door to the library for chess and new books….. Some days are just this way. Too many sinners in a house all busy sinning as hard as we can. We hurt each other. We quarrel, we say rude things, we yell, and we pout. But grace leans in and brings us the chance to make amends. The chance to really forgive, to really overlook that super annoying sibling, to bless instead of curse. To, slowly, so very slowly, climb the mountain to holiness. These days encourage me. Not because of the progress we’ve made but because of the grace we receive. 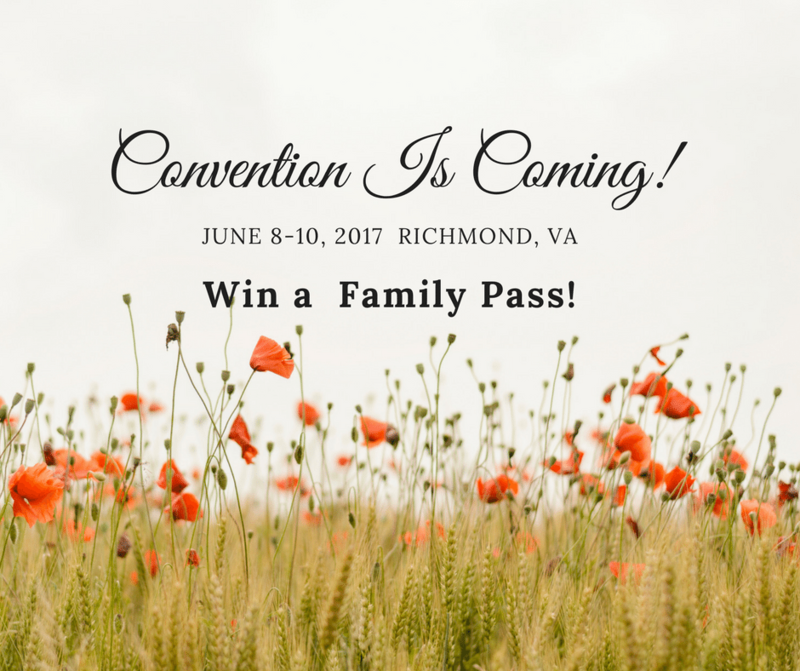 Don’t forget to go here and enter the contest for a Family Pass to the HEAV Convention in just a few short weeks! This entry was posted in Discipleship, Encouragement, Giveaways, homeschooling, Life, spiritual formation and tagged 2017 HEAV Convention, conve, Free pass to homeschool convention, homeschool convention, homeschooling, homeschooling with toddlers, summer homeschooling. Bookmark the permalink.